One of my favorite parts about this blog is putting together unusual or seemingly incompatible ingredients and flavors, then seeing what happens. This typically works out in the end, but sometimes I end up with a bit of a mess that is far from what I envisioned an ideal end result would be. When I first started putting this white gravy recipe together in my head, I thought that there would be a good chance this would fall into the failure category—but instead was thrilled that this tasted amazingly close to what I remember eating on a regular basis years ago. I grew up in the southern part of the United States, where white (sawmill) gravy and chicken-fried steak was served everywhere. I ate it all of the time, although I never exactly knew or thought about what chicken-fried steak really was. And although I would never consume an animal-based version of this dish ever again, I do have good memories of eating this rich and creamy gravy smothered over a fresh homemade biscuit. The best part was how this gravy kind of soaked into the middle of the biscuit, while the outside of the biscuit remained crisp and golden. This gravy achieved the same thing here, and I loved every single bite of it. Place the broth into a small saucepan and add in the TVP. Heat over medium-low until until it starts to simmer. Turn off the heat and allow the TVP to sit for about 10 minutes. Heat the olive oil over medium heat in a medium-sized skillet. Add in the shallots and saute for about 3 minutes. Add in the garlic and shiitake mushrooms. Allow the ingredients to simmer for about 5 minutes, stirring occasionally. Next, add in the TVP and stir to combine. Simmer until most of the moisture has evaporated, then add in the sage, fennel seeds and basil. Stir again. Add in the soy sauce. Season with salt and pepper, and adjust any seasonings as needed. Reduce the heat to the lowest setting. To make the gravy, place the soaked and rinsed cashews into a blender with the vegetable broth and coconut vinegar. Puree until smooth. In a medium-sized saute pan, melt the Earth Balance over medium-low heat. Add in the flour and stir to combine. Transfer the cashew creme to the pan and stir well. Sprinkle with salt and pepper, then add in the broth. Add in the almond or soy milk as needed to thin it out to a desired consistency. Simmer for a few minutes more, then serve immediately with the hash and freshly made biscuits. interesting! i didn't know you grew up in the south! i've never eaten chicken fried steak or sawmill gravy and biscuits, but i'd totally eat your vegan versions in a heartbeat. i don't think i've ever even had a gravy soaked biscuit and now i totally feel like i've been missing out! Oh wow- I haven't had biscuits and gravy in probably 20 years, and never would've missed until now! This looks so comforting and delicious! The gravy was outstanding!! It tastes JUST LIKE the gravy from back home! We couldn't stop saying how good this was while we were eating it. The hash was great, too. Thank you! So glad you tried it out and enjoyed! 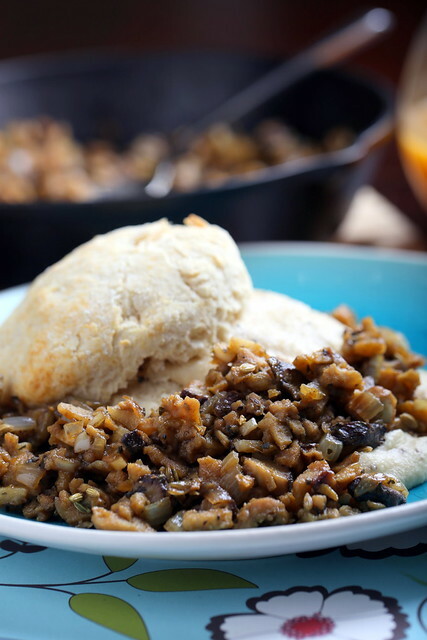 I am always on the hunt for a great vegan gravy, so I can't wait to try your version! This was great! Better than the "real" thing. We had trouble putting our forks down! Thank you so much for sharing this recipe! So happy you enjoyed, I love to hear that! 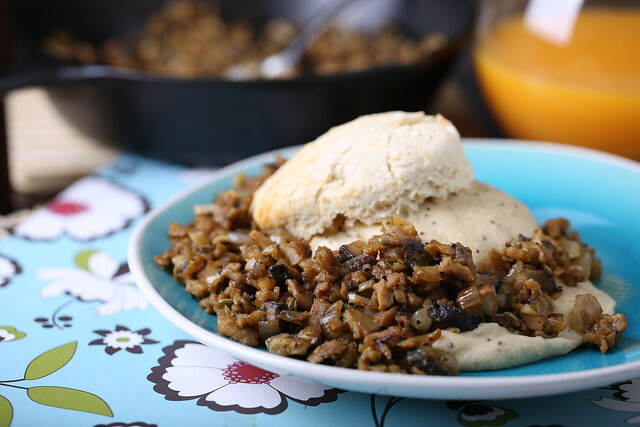 I just posted about biscuits and gravy and this morning was cruising the Internets to see what other vegan bloggers have done with biscuits and gravy. I know it's not common everywhere, but I really didn't realize people in the US might not know what white/cream gravy was. I live in the Pacific Northwest and most people here are familiar with it, or at least have seen biscuits and gravy on the breakfast menu of most restaurants… though I agree, it's absolutely more common in the South, for sure… Your biscuits and gravy AND hash, all look yummy!